University of Maryland Upper Chesapeake Health (UMUCH): In 2013, Upper Chesapeake Health formally merged with the University of Maryland Medical System. The University of Maryland Uppe r Chesapeake Health (Upper Chesapeake Medical Center in Bel Air and Harford Memorial Hospital in Havre de Grace) is a community based nonprofit health system dedicated to improving and maintaining the health of people in the community through an integrated health delivery system. Upper Chesapeake HealthLink: HealthLink is the University of Maryland Upper Chesapeake Health (UMUCH) community health improvement department. HealthLink nurses and health educators provide medical screenings and education programs through out the community. Free medical screenings include blood pressure, body fat/body composition, stroke assessment, sleep apnea assessment and more. Diabetes A1C tests, cholesterol tests, and bone density tests are also provided for a slight fee. Educational programs provided to the public include Kids Against Tobacco, Glow Germ, Tattoos and Piercings, Teddy Bear Clinics, and How Sweet it Is. To request HealthLink at your next event, contact Judy Lauer at jlauer@uchs.org or 1.800.515.0044. 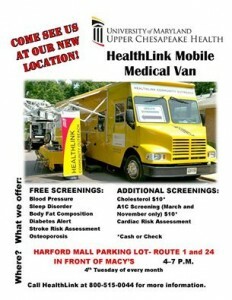 UMUCH Public Health Screenings: Health Screenings are provided monthly on the UMUCH mobile van every 4th Tuesday of the month in the Harford Mall parking lot on the corner of Rt. 1 and Rt. 24, right in front of Macy’s from 4pm to 7pm. West Cecil Health Center/Beacon Health Center: West Cecil Health Center and the Beacon Health Center are Cecil and Harford County’s only Federally Qualified Health Centers. Between these two sites, patients can access primary care, women’s care, mental health services, and dental services. All Federally Qualified Health Centers accept patients of all ages, income levels and insurance status, which means anyone can receive services regardless of whether or not they have insurance. All services are provided on a sliding scale fee. Se habla espanol. West Cecil Health Center, 49 Rock Spring Road, PO Box 99, Conowingo, Maryland. Tel: 21918; Beacon Health Center, 253 Lewis Lane, Suite 202, Havre de Grace, telephone: 4443-502-7060. Hours of operation. Healthy People 2020: Let this site help guide you to be a healthy person by learning about how to make better choices for yourself and your family when choosing doctors, health insurance, online health information, and a healthy lifestyle. 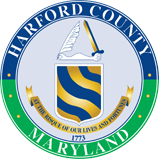 Street Card – Harford County’s printable and foldable pocket information card with information and resources on health, housing, food and services resources within the community, in particular for low income and underserved Harford County residents. This card is updated every year. Quick Guide to Healthy Living: Find information and tools to help you and those you care about stay healthy. Topics include heart health, cancer screenings and prevention and diabetes. Centers for Disease Control Healthy Living: This site provides a wide range of information from health topics including mental health, bone health and sleep disorders to staying healthy tips, links, data and statistics updates, and health campaign and program news. Body Mass Index Calculator: Body Mass Index (BMI) is a number calculated from a person’s weight and height. BMI provides a reliable indicator of body fatness for most people and is used to screen for weight categories that may lead to health problems. Recipe for homemade Pedialyte (oral rehydration salts/solution) so you can avoid the added artificial colors and flavors. Harford Crisis Center – Phone: 1.800.NEXT.STEP. The Harford Crisis Center includes the Mobile Crisis Team, providing crisis intervention and emergency mental health care within the county at the location of occurrence, whether it is a home, office, school, mental health or substance use disorder urgent care, behavioral health walk-in appointments, assessments, and residential beds. MD Crisis Hotline Network – 1-800-422-0009. All centers operate 24-hours a day, 7-days a week, 365 days a year. Now the Maryland Crisis Hotline Network is providing online crisis chat services Monday-Friday 4pm-9pm. Office on Mental Health/Core Services Agency – 410.803.8726. 125 N. Main St., Rear entrance, Bel Air, Maryland 21014. We work with mental health consumers, providers and community partners in Harford County, MD to create comprehensive programs and services that are recovery oriented. Harford County Health Department – 410-877-2340, 120 South Hays Street, 3rd Floor, Bel Air, MD. The Harford County Health Department Division of Behavioral Health is proud to offer a range of services. The Substance Use Disorder – Intensive Outpatient Program (SUD-IOP) is a continuum of structured therapeutic and assessment services appropriate for those with significant substance use problems who may be safely maintained at home outside of treatment hours but require more intensive treatment than is available through general outpatient treatment. ACR Addition – 443.417.7810. P.O. Box 41, Jarrettsville, MD 21084. ACR connects with substance abuse prevention programs, addiction treatment centers, halfway houses, support groups, therapists and other persons and/or organizations involved with the initial and extended treatment of substance abuse in an effort to formulate a continuum of care that adequately addresses the holistic needs of the substance abuse population. Free Stop Smoking Classes – available at the Harford County Health Department. Free nicotine replacement therapy also available if you are meet income eligibility. Call 410-612-1781 for more information. Stop smoking 24/7 quit line – smoking stops here – live counselors 24/7. 1-800-QUITNOW. MDQuit.org – policy and service group with the goal of creating a tobacco free Maryland. Be safe in the Sun – advice from the American Cancer Society. Pick the Best Sunscreen – Many sunscreens have chemicals in them that can cause allergic reactions or aren’t as effective as they claim. Check this database to see which sunscreen is best for you. SARC – Sexual Assault/Spouse Abuse Resource Center, works to end domestic violence, sexual violence, and stalking; to aid its victims and to create a society free from abuse and fear. SARC is Harford County’s lifeline to victims, potential victims, and survivors of domestic violence, sexual violence, child abuse, and stalking. All of SARC’s services are offered free of charge*, including a food and hygiene pantry available to clients in SARC’s Safehouse, Legal, or Counseling programs. Please call SARC’s 24 hour Helpline to find out more information about all of SARC’s services: 410-836-8430. SARC provides services in a confidential environment of trust, respect, and mutual accountability without regard to race, creed, gender, marital status, sexual orientation, or economic circumstances. *SARC offers an Abuse Intervention Program at a secure location for an additional fee, call 410-836-8431 for more information.